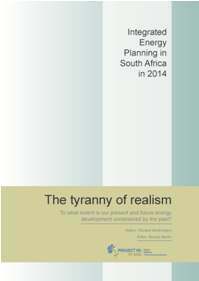 This publication draws on the work of many concerned with astute Energy planning in South Africa today, and seeks to present a coherent body of opinion, with the emphasis on providing food for thought, rather than attribution. Richard Worthington has taken on authorship for the purpose of sharing his insights as a South African energy policy researcher and activist over 18 years and in order to stimulate and enable broad participation in South Africa’s second national Integrated Energy Planning (IEP) process currently in progress. This process is slated to deliver a Final Report to Cabinet in the fourth quarter of 2014. Production of this publication is the final part of a six month project – Integrated Energy Planning in South Africa – undertaken by Project 90 by 2030 and funded through the British High Commission, which ended in March 2014. The project included desk research, stakeholder interviews, a one-day workshop hosted at Wits University and finally the writing up of findings. The initiative was implemented by Richard Worthington and fellow Energy policy practitioner Brenda Martin and facilitated by Peter Willis of the Cambridge Programme for Sustainability Leadership. The current Integrated Energy Planning process is the only formal and public process available that considers the value propositions of massive energy infrastructure investments (over R1 trillion in the electricity sector alone) and related developments in rail infrastructure and inter-basin water transfers. It also provides the only engagement explicitly considering what our greenhouse gas emissions should be to 2050, with energy accounting for about 80% of total national emissions. This entry was posted in Book Reviews, Energy, Policy, Project 90 and tagged Low Carbon, policy, Project 90, Renewable Energy, south africa. Bookmark the permalink.